Everyone knows that a cowboy will rope anything that moves: cows, dogs, cats, bales of hay, unsuspecting fellow-cowboys… So, when some local goats escape their pen and turn up near Wolf Creek, Deputy Kile knows just who to ask to help him round them up: Slim Chance. 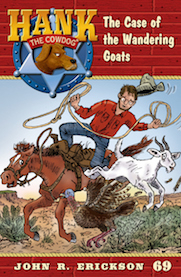 Hank and Slim spring into action and go in search of the lost goats, but they could never have foreseen the dangers and surprises they’d face in the course of this rodeo rescue mission. Who is this mysterious and majestic sheep-king and his subjects that Hank finds? And, if they aren’t the little show-goats Deputy Kile described, what are they doing on the ranch? This may not be Hank’s first rodeo, but it’s certainly the strangest!